The following post was sent to us by PPL Susquehanna’s Francis Golomb for NEI’s Powered by Our People promotion. Powered by Our People is part of the Future of Energy campaign that NEI launched earlier this year. This promotion aims to communicate innovation in our nation’s nuclear facilities in the voices of the people working at them. Francis Golomb is an electrical journeyman in the predictive maintenance group at the Susquehanna nuclear power plant in Luzerne County, Pa. He’s worked at Susquehanna for 10 years after earning a certificate in electrical occupations from Pennsylvania College of Technology. He’s also a certified Level I thermographer. Francis Golomb uses new infrared technology for cutting edge diagnostics testing. I perform several different types of equipment testing that help detect potential issues before they become problems. One common type of testing is the use of infrared cameras to make sure the temperature of equipment is what it’s supposed to be. 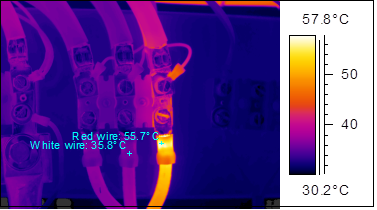 For example, if we find a hot spot on an electrical connection, we know we need to replace it before it shorts out. Or we may find a solenoid valve is cool, which tells us it isn’t working. We also use other technologies like ultrasonic testing, which is the use of sound waves, to find potential equipment issues. I also do electrical current signature analysis and partial discharge analysis. We use the information from these tests to monitor equipment on a regular basis and track performance to make sure there are no adverse trends. From there, we work with engineers to help determine the best time frames for replacing or repairing equipment. For example, we recently found an electrical connection on a main generator breaker that was hotter than normal. We were able to replace it during our last refueling outage — long before it became a reliability problem that would have required us to shut down the unit to fix. Because of what our group does, the plant operates safely and reliably. Everyone at our plant knows that we have a responsibility to protect the public by keeping the plant safe. That responsibility is very personal to me since my family lives near the plant. I enjoy the technology that lets us “see” into equipment where the human eye can’t. I get to see a world that most others don’t, and get a great sense of satisfaction from helping to interpret the messages our components send us. Through our regular communications with our equipment, our plant tells us ahead of time when it’s not working right so we can fix it before things become problematic. With early detection, we have the time to plan the repair in the most cost effective manner. We have the time to find the best equipment, have it shipped to the plant, and then installed under optimal circumstances. Knowing my work prevents an expensive rush repair or having to shut down a unit unexpectedly is gratifying. PPL Susquehanna infrared testing checks equipment temperatures. We keep an eye out for improvements to technology that allow us to monitor more equipment or monitor it more effectively. This year, we bought a new infrared camera that was smaller and more flexible so we could see around obstructions to test equipment we hadn’t been able to before. The new camera also has more color palates, or color scales, that we’re experimenting with to see which provides us with optimal information. The work our group does helps keep our plant operating safely and reliably and that goes a long way toward building public confidence in our industry.